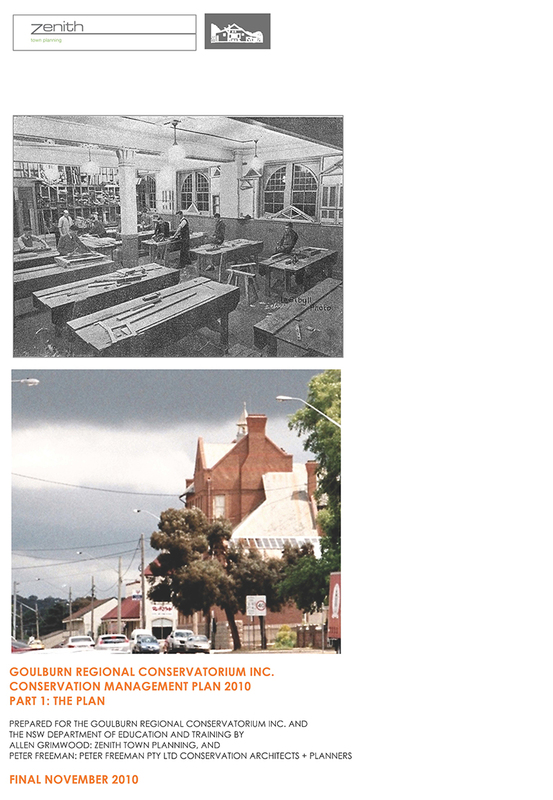 The Goulburn Regional Conservatorium Inc. engaged Allen Grimwood of Zenith Town Planning and Peter Freeman of PFCA+P to prepare a Conservation Management Plan for the former Goulburn Technical College building currently occupied by the Conservatorium. The plan was written jointly, with the assistance of Ms Noni Boyd, architect and historian. The plan was prepared during the months of September and October 2010, such that the Goulburn Regional Conservatorium were able to satisfy its obligations to the NSW DET by the agreed lease date of December 2010.